This is a small and easy-to-use tool for converting Gravity’s Emblem files. 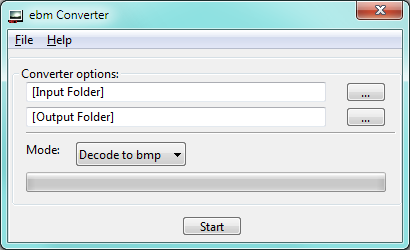 It can decode ebm files to bmp and bmp files back to ebm format. This is the first tool of my planned RO-Tool project. Orginally it was only a test-tool for testing my libebm. But after the work was done I’ve decided to release it as a simple standalone tool. -> want to translate? Contact me!